If you didn’t know, E and I live in a teeny tiny one bedroom apartment. So small that majority of our furniture lives all over the district, stored with different family members. It’s perfect for us because it is in prime location, we have river views from the driveway and the rent is quite low. Whilst there are so many perks to living “compact” we don’t have a second bedroom to use as an office so ALL of my blogging is completed on the couch, in my bed or wherever I’m sitting when inspiration strikes. But this weekend E and I worked out we had the room in our bedroom for a desk, and you have no idea how ecstatic that made me. 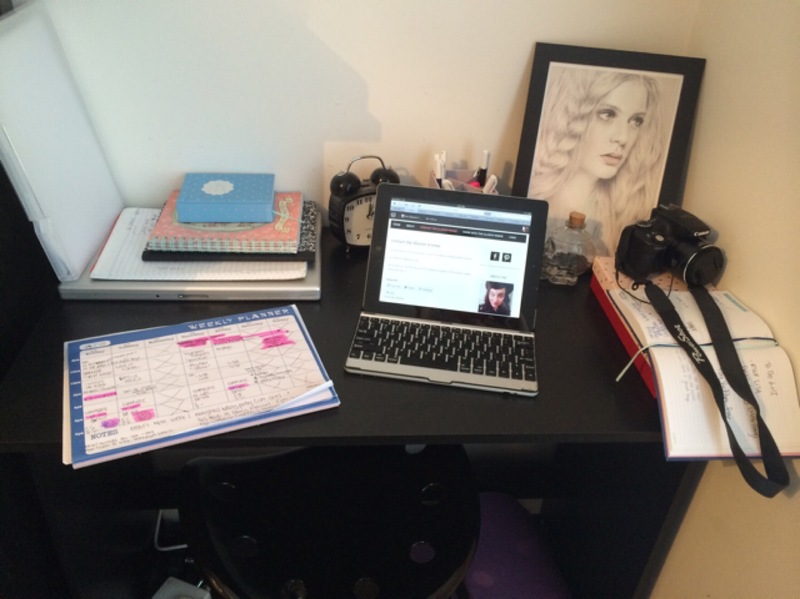 I was finally going to have my own blogging corner! I’m pretty easy to please! Being the responsible adults we are, E got her handy man pants on (she’s actually pretty good with a tool kit) and got measuring the tiny corner, and we did some research. Turns out desks can get pretty pricey, but after scouting a number of websites I found the perfect little baby that was the correct size, conveniently matched the other furniture in our bedroom and looked simple and cute! And a matching stool of course. Going out and getting a desk also forced me to stop in at the Salvo’s on the way because the flat pack wasn’t going to fit into the car with the five bags of clothes ready for donation taking up ample space in my back seat and boot. I’d like to introduce you to my new little blogging spot. I feel like this place will keep me inspired and fresh. I finally have my own little space to get the creativity flowing and I’m feeling very much at home in my little corner. Plus it has been great for my shoulder and neck to actually sit up and blog – writing lying down is not very good for your posture! E also got me a super cute keyboard attachment for my iPad. I have a laptop but I find it easier blogging on the WordPress app’s over the real website. Gotta do things the easy way! I love how it is such a convenient contraption that just fits perfectly with the iPad – and now my tablet feels like a mini computer! My gorgeous gifted print by Nevertheless has also found a new home on my desk amongst my stationary and electronics, I think she fits in perfectly. Happy blogger. Where do you blog? Do you have a designated area or are you one of those ‘whenever, wherever’ types? PS – I’m so obsessed with my space right now that I told E she’s not allowed to use it. BAHAHAHA. I must learn to share. I blog in bed….seriously though, I love to be comfortable when I’ve got my head in editing and writing. I work best at night time due to my nocturnal ways. I have a desk, but I find that I still love to explore my creativity with a cup of tea and my fluffy pillows. I don’t blog but I love your new blogging space. Perfect. At least now you have the choice between relaxing on the sofa and blogging or sitting at your desk (all official like). How good is it to have a desk? We have 2 bedrooms but the second one is quite small and totes set up for guests, so my blog spot is the dining room table. 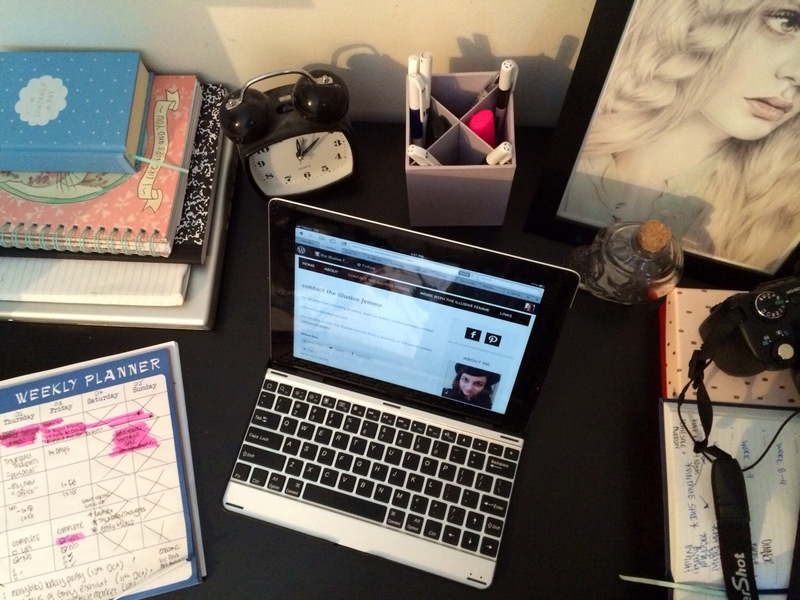 When I grow up, I’d love a home office and a blog spot all of my own! I blog where ever I can see the kids and find a space. I dream of my own desk too. One day!! You’ll get one Jo! Took me ages Hahaah! I used to have a laptop and mostly blogging in bed, but now like you I have a desk in the corner of my bedroom. I also changed to a desktop to help regulate how much time I spend blogging / working. That’s a good idea Lila! I think I spend way too much time blogging and surfing the net! I should probably monster my time too! I’m the complete opposite, I have an pretty decent desk with a nice chair, complete with a nice whiteboard…but I choose to do it all on the couch while I am watching TV lol! I do love your space though, and I hope it inspires lots of ideas! I have a little desk near the kitchen, so I can work in between doing stuff. My former office space has been taken over by my daughter as an art room, but I do have a couch in there if I need a change of scenery. Your space looks perfectly inspiring! I have no idea what it is Sonia, but I just feel completely relaxed yet motivated! It’s surprising really, haha! This is a lovely little space! I am also guilty of blogging in bed, I find that I work best wherever I’m most comfortable but I would looove my own office space one day!